With Nassau as its capital city, New Providence Island is one of the Caribbean’s most easily accessed destinations. The island’s main tourist draw card is, of course, the behemoth Atlantis resort on Paradise Island. 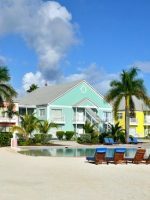 But for families looking for a different kind of Nassau vacation close to one of the island’s best beaches — and with a whole lot of real Bahamian character — Compass Point Beach Resort is a true gem. The property was formerly owned by Chris Blackwell of Bob Marley/Island Records, and sits right across from the renowned recording studio where such greats as Jimmy Buffet and AC/DC have laid down tracks. Appropriately, each of the hotel’s rooms pays homage to a famous musician with local ties. The musical theme even continues with great speaker systems, iPod docking stations and CDs with eclectic music in the rooms. You’re far removed from the cruise ship hordes and Atlantis masses here in the western part of the island, yet only about 20 minutes from those sites by car or jitney (the public transport shuttle busses stop a few steps from the resort). The oceanfront property skirts a sea wall, with 18 very comfortable “huts” that are made from wood and painted in every color of the rainbow making for a cheery scene. There’s a medium-sized pool perched right over the ocean, and a hot tub in a more secluded area near the pier — this is particularly appealing on a cold winter night beneath the stars. The resort’s fishing pier extends far enough into the clear Caribbean waters to toss out a fishing line and snag something (if you don’t have your own rig, the general manager is happy to lend his out), and the hammock on the end is a prime spot to sink into at sunset. 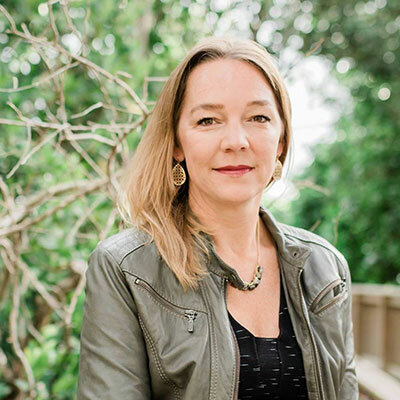 The resort markets itself to couples far more than families, and it’s important to know that you won’t find guardrails along the seawall here — the property feels beautifully connected to the surrounding seascapes. If you’re traveling with small children, you’ll have to be on alert for sharp rocky corners and the like. 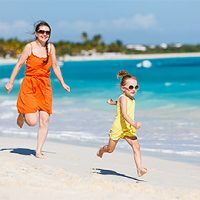 For families with older children, however, Compass Point can strike a very appealing balance between family fun for the gang and Caribbean escapism for the adults. 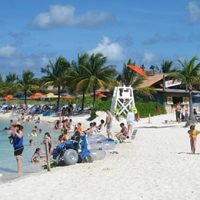 The onsite restaurant and bar are one of the most popular settings for locals to gather — both Bahamians and expats — for sunset with a cold Sands beer. And local families occupy the large outdoor tables with booth style seating right at the water’s edge. While the ocean is right in front of you at the resort, you’ll find the best beach access by walking through a gate lining the property’s edge, past a neighboring residence along the water, to access the true sandy stretch of Love Beach. This is one of the nicest — and longest — stretches of sand on the entire island, and at the beach club called Nirvana, you can rent jet skis and kayaks. There is also ocean access near the pier on the resort property, but the steps leading down to the water become almost completely obscured at high tide. As far as things to do within walking distance of the resort, apart from the beach, there’s not a whole lot. It’s worth walking just east of the resort to the public boat ramp, across from which one of the island’s best conch salad stalls sets up for business most nights. The resort’s elevated huts that are directly oceanfront are particularly nice as they have outdoor kitchenettes on the ground floor, with a shaded picnic table for meals al fresco. If your group is large, you can book several huts next to each other and have the feeling that you’re staying in your own personal oceanfront resort. If you’re going to Nassau with the family, chances are, you’re going to spend some time at Atlantis (there are day passes available to the water park). 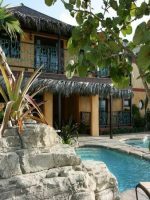 But spending a few days of your trip at Compass Point Resort might be just what you need to truly feel like you’re in vacation mode and experiencing something of the Bahamas’ more authentically Caribbean side. Spending your days snorkeling and swimming in the beautiful clear waters, splashing in the Compass Point pool and swaying in the hammock or rocking chair on your oceanfront terrace has all the makings for a family vacation in a little piece of paradise. 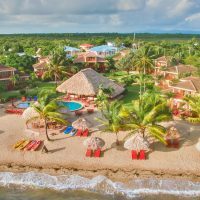 Compass Point has 18 different stand-alone huts painted every color of the rainbow and arranged in two rows amongst beautiful tropical foliage right along the ocean's edge. Most of the rooms are octagonal shaped with high ceilings to let air circulate, and balconies with colorful rocking chairs overlooking the ocean or landscaped pool area. Wooden floors are standard throughout, and the tiled bathrooms are decked out with super fluffy towels and Aveda bath products. Some of the huts are set back a bit from the water, while others are perched practically overhanging the clear blue Caribbean. A cobblestone sidewalk winding through the resort connects the huts to the restaurant and spa, and leads to the beach access on the far western side. Most of the huts feel private and more along the lines of a beach house than a hotel (huts closer to the swimming pool may be subject to noise from the restaurant and pool). The studios are the smallest accommodations, set up in a row just back from the water's edge and behind the pool. Like all of the rooms onsite, the studios have in-room coffee and tea making facilities, a mini fridge, toaster and a microwave, as well as ceiling fans and in-wall air-conditioning units. The windows in the huts are traditional Bahamian wooden plantation-style shutters with slats that open, and screens to keep insects at bay. The elevated huts are roomier, with space for an aerobed for parents traveling with one or two children. And there's one elevated hut in the second row back from the ocean that's connected by a private staircase to a smaller ground level hut with a small daybed inside that could accommodate two young children (there's a separate outdoor shower adjoining the room, and an enclosed toilet on the ground floor, in addition to the full bathroom and shower facilities upstairs). A perk of booking one of the elevated huts versus one positioned at ground level is the open-air kitchenette and dining space (with a shaded picnic table) located just underneath. These kitchenettes have a two-burner stovetop and full sink, plus pots and pans so you can cook basic meals for everyone al fresco and dine right there in the shade with ocean views. Casual Caribbean decor is the theme in all the rooms, with wood and dark wicker furnishings and bright splashes of color on the beds. DVD players and iPod connectors for the in-room sound system are standard throughout, and there's a library of movies you can borrow that includes some kids programming. My husband and I bought a day pass to Compass Point while on a Bahamian cruise. We had the place pretty much to ourselves. It was idyllic swimming in the Caribbean blue waters, sitting on the pier, and enjoying good food and drink. Highly recommended! If this resort were located anywhere else but at water's edge it would be lucky to demand a $100 rate a night -- badly in need of renovation, bathrooms are terrible, cushions on lounge chairs badly stained -- go for the view and a drink - don't stay or eat there ! Most families who come to Nassau either arrive by cruise ship or plan their vacation around the enormous Atlantis resort. So vacationing families who make their way to Compass Point are already in a class of their own. Here, it's all about being outside, snorkeling, playing in the water and enjoying beautiful Love Beach just west of the property. If your family's the kind that can't be entertained by sun, sand and water alone, you might want to rethink a stay here. But if it's pool, beach, sun and great weather you're after, then this is a great spot. Spend your days snorkeling just offshore, fishing off the resort's pier or building sandcastles on Love Beach. Visit the beach club called Nirvana on Love Beach to rent jet skis, kayaks and other water toys. Compass Point has a paddleboard guests can rent to get out to the nearby fringing reef, where a mask and snorkel will give you a view of all kinds of tropical fish, lobster and perhaps a sea turtle or two. You can plan day trips and activities around the island very easily from the hotel, with snorkeling trips offered with Stuart Cove's Dive Bahamas, a short ride away, and day passes available to the Aquaventure waterpark at Atlantis. Walk a few doors down from the resort to the neighborhood conch salad stand, an outdoor stall of a restaurant where locals and tourists converge to try the island specialty of chopped raw conch embellished with tomatoes, orange juice, peppers and pineapple (on the weekends, a conch salad stall sets up on the outdoor terrace of the Compass Point restaurant, too). Room rates include a daily credit of $15 per person, which can be applied toward breakfast at Compass Point's restaurant, a casual indoor and outdoor setting with great sunset views and a loyal local following on the island. Breakfast items include omelets, eggs benedict, smoked salmon and Bahamian fish stew. Among the offerings for kids are cereal, cinnamon and coconut-encrusted French toast and pancakes. The resort's restaurant serves lunch and dinner, too, with a focus on fresh red snapper and lobster. On the menu for lunch and dinner for kids are the usual suspects -- chicken noodle soup, mac and cheese, hot dogs and hamburgers with fries, chicken tenders, fish fingers, grilled cheese and chicken quesadillas. All items from the kid's menu cost $10, and if you're looking for a healthier option, you can replace the fries with Bahamian peas and rice. There are no other dining options (besides the local conch salad stall and barbecue grill down the road) within immediate walking distance of the resort, but it's a short taxi ride to the Fresh Market grocery store, where you can stock up on any food items you need. Other restaurants are also a short taxi ride away in Sandyport and Cable Beach. It takes less than 10 minutes to get from Nassau's international airport to the resort, and you can either grab a taxi after you arrive just outside the terminal, or arrange ahead of time for the resort to send its driver to pick you up (count on paying between $15 and $20, depending on which option you choose). The island's public busses (called jitneys) stop just outside the resort, and can take you around the island, from downtown Nassau and Paradise Island to the popular Fish Fry food stalls where you'll find all kinds of Bahamian fare being cooked up. Alternatively, renting a car makes sense if you want to have the independence to come and go as you please (there's free parking in a secure parking lot just across the street from the hotel). Unless you're planning to spend a lot of time in downtown Nassau or at Atlantis resort during your stay, there's no need to bring a stroller -- the streets outside of Compass Point aren't pedestrian-friendly, and there's nothing within safe walking distance that would necessitate a stroller. Wi-Fi is complimentary and works well everywhere on the property, from the restaurant to inside the huts. There are no public laundry facilities onsite, but if you need to do laundry, there's a service located about 10 minutes away, by car. The Bahamas are a notoriously expensive destination, and Nassau is no exception. Snack items that your children are used to eating at home may not be available here. And if they are, chances are they'll be several times as expensive as they are at home. The Fresh Market and City Market grocery stores are where you'll pick up these items, but you should also consider bringing some of your kids' favorite snacks with you to the island. Babysitting services with trusted sitters from the area can be arranged through the hotel's reception desk. The hotel's small, but sufficient one-room spa, Windrose, is located inside one of the cute octagonal-shaped huts right near the hotel's reception desk. The single therapy room has twin massage tables that invite you to splurge on a couples' massage (solo services are set in the same room), and facials and wraps are also performed in this space. In an adjoining room, there's a pedicure and manicure station, and waxing services are also offered. The spa uses Pevonia products. There's no fitness center onsite, but at the western edge of the property, you can access beautiful Love Beach, which is perfect for a run at low tide (or a strenuous walk when the tide is high and the sand is soft). The beach is one of the prettiest on the island, with clear waters for snorkeling and blindingly white sand. Down the beach at Nirvana, an oceanfront club, you can rent jet skis and non-motorized watercraft. Compass Point's fishing pier is open to all guests (bring your own rod, or ask the manager - he's usually more than happy to lend his out), and there's a nice hammock strung here under the thatched palm open-air roof, where you can swing while watching the stars. Try your luck casting and chances are very good you'll get something on the line within a few minutes - kids love it. There are steps leading down from Compass Point to a small beach that nearly disappears at high tide. It's a good place to get in the water if you don't want to walk the few minutes to Love Beach. A nice perk: Books are meant for you to keep, so if you start reading one and can't finish it, take it home. Outside of specific holiday periods (Christmas and New Years), room rates at the resort remain stable, which is not to say that the tourist crowds do likewise. Mid-January to mid-May is the busiest time on the island, and you'll find long waits at restaurants and attractions everywhere. The summer months, from June through August, are generally very slow despite the beautiful weather (yes, it's hot, but the ocean always makes it bearable), and it's a good time to have the resort mostly to your family. The bar and restaurant are busy throughout the year, as they have a loyal local following. Keep in mind that hurricane season in this part of the Caribbean runs from June to November, and even if a storm isn't bearing down on the island, the waters can still be choppy. The ocean tends to be smooth as glass during most winter months, when the water temperatures cool down but are still comfortable enough for swimming. Nassau's airport is serviced by nonstop flights from many cities in Florida, the Northeast and Canada, including Miami, Orlando, New York, Atlanta and Charlotte. There is also regular nonstop service to and from London with British Airways. Bahamas Air, the national carrier, operates from U.S. cities, and among the American airlines flying to Nassau are Jet Blue, Air Tran, US Airways and Spirit Airlines. All of the major car rental companies have desks at the airport, which you'll see just as you come through the arrivals area with your bag. Taxi drivers will approach you if you don't have a driver scheduled to pick you up. When you depart from Nassau to U.S. destinations, you'll clear U.S. customs right in the Nassau airport before boarding your flight. It's advisable to arrive three hours before your flight home to allow ample time for the formalities, but the airport is quite comfortable and even has a restaurant with outdoor seating so you can still soak up some Caribbean sun. Thanks to the hotel's babysitting services, it's easy enough for parents to arrange a night away from the kids. And there are a few very nice restaurants within a short drive of Compass Point if you decide you want to dine off of the property. Mahogany House is a sophisticated spot with big mahogany tables, an open kitchen and delicious gourmet pizzas and pastas, as well as an extensive wine cellar. And Olives Meze Grill, about 15 minutes away in Cable Beach, makes a nice date night, too, with delicious Greek dishes and octopus fritters on the menu. If you're up for the 25-minute ride to Paradise Island, there are always the celebrity chef restaurants of Atlantis, like Nobu and Bobby Flay's Mesa Grill (not to mention the casino and famed nightclub, Aura). Alternatively, book a fun night in at the resort by telling the restaurant at Compass Point that you'd like to reserve the pier for a romantic private dinner surrounded by the lapping waves and tiki torches.